Your free proofreading exercises are below. These free proofreading practice exercises are suitable for adults and children, including key-stage 4 pupils, keystage 5 pupils, high-school students, middle-school students, college students, university students and ESL students. And if you don't find these exercises particularly challenging, it could be you're a proofreading natural. Why not consider a career in proofreading? Click here for our proofreading course. Most proofreading courses include vast swathes of proofreading exercises in their manuals or course work, which means the cheeky little blighters actually expect you to pay for the stuff. Here at The No-Nonsense Proofreading Course, we'll be providing you with a plentiful supply of printable proofreading exercises, gratis. Plus, the eBook itself points you to a near-limitless supply of exercises that will not only help you get in practice but will form a crucial part of your promotional activity once you start looking for paying proofreading work. The proofreading exercises above can be used in conjunction with the proofreading course itself, particularly after you’ve read Chapter 5 and are armed with your proofreaders’ marks from Chapter 3. 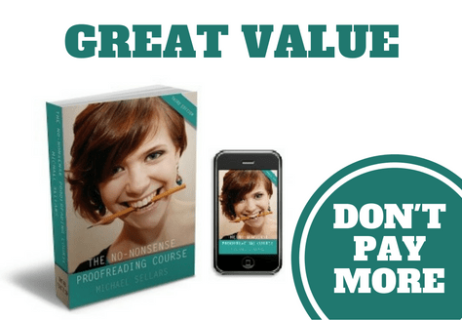 These proofreading exercises are designed to realistically simulate the kind of proofreading work you’re likely to encounter in the real world. Many proofreading courses provide you with exercises that are utterly crammed with errors, but you are unlikely to come across this kind of thing in a professional environment. So, we’ve created proofreading exercises which contain only a few, hard-to-spot errors. Remember, once you’re carrying out real-world proofreading assignments, you’re going to be dealing with people who take pride in their work. Errors won’t simply jump off the page and announce themselves, you’ll have to go looking for them. Sometimes (in fact, quite often) it can be like looking for the proverbial needle in the equally proverbial haystack. Okay, not exactly the most challenging of proofreading exercises, but they are pretty good for those of you still trying to find your feet, or if you're just looking for something to help you limber up before you hit the hard stuff. Click here. Quick and easy to use, this little test will assess your understanding of some of the finer points of grammar. Click here. This is a great little test, and the Plain English Campaign website is worth visiting for a whole host of reasons. Click here.